Editorial Note: This article is a slightly edited version of an article that appeared last year at Easter. Every year at Easter as we look forward to the great Passion music, we are accustomed to hearing the usual shrill accusations of anti-Semitism. The purpose of such accusations is to force non-Jews to feel shame for a civilization whose art supposedly resulted in atrocities against the ancestors of the Jewish activists. A new twist on Jewish perceptions of Easter can be found in Rabbi Boteach’s book, Kosher Jesus, in which he defends Jesus as one of the tribe’s own, but stops short of accepting Jesus as God or as the Jewish messiah. What could be a Hasidic rabbi’s motivation for writing a positive portrayal of Jesus? After all, Jews have found the person of Jesus anathema for pretty much the entire history of Christianity. That Rabbi Boteach and other prominent Orthodox Jews now purport to regard Jesus as a welcome racial insider worthy of intense sympathetic study does not portend well. In the following I discuss the Jewish campaign to transform traditional Christianity in a way that serves Jewish interests. Medieval Christendom and twentieth-century National Socialism resembled one another in that both were highly collectivist societies intent on protecting their non-Jewish majorities from groups hostile to their interests, particularly from Jews. The Catholic Church through its teachings and practices instilled in Christians a deep awareness of the hostile otherness of Jews. Likewise, during the years of National Socialist power in Germany, the Protestant Christian Church strove to guard its followers from Jewish influence. Both were built upon a Germanic pagan foundation. As described by James C. Russell in his The Germanization of Early Medieval Christianity, the Catholicism of the Middle Ages grew upon a pagan substructure. The Christian Protestant Church of the National Socialist era recovered early Germanic elements and incorporated them in the tradition of the Medieval Church. After World War II both the Protestant and Catholic Churches were stripped of their Germanic heritage. The assault on the various Christian sects rendered Christianity powerless to provide its followers the collectivist security that they had in earlier eras. When Christian missionaries were attempting to convert tribes of Germanic peoples in the early Middle Ages, it was necessary for them to adapt Christianity so as to render it acceptable to a population with a very different world view. While the Christian missionaries’ religion was characterized by forbearance, conciliation, and personal salvation, the Germanic tribes were characterized by “intense group solidarity, ethnic homogeneity, social hierarchy, and heroism dependent on military glory.” To reconcile these apparently incompatible world views, European folk traditions were incorporated into the Christian conceptual structure. Moreover, the inherent affinity between religion and state that had existed among Germanic tribes was also subsumed. In this way the religion of the early Christians was transformed into an authentic European religion, one that was distinguished by its cohesive ethnicity, group solidarity, political allegiance, and ability to withstand outside attack. For Indo-Europeans, including Greeks, Romans and the Germanic tribes, a close natural alliance existed between religion and the state. This religio-political partnership within Germanic societies, embodied in the kingship function and continuing at least throughout the Middle Ages, may well signify the most significant long term component in the Germanization of early medieval Christianity. The alliance between a re-Germanized Christianity and the government of the Third Reich created a similar religio-political paradigm. After the wars of the Reformation and the division in the Church into various Protestant sects with a multiplicity of beliefs, Germanic elements in Protestantism diminished. Nevertheless, the Protestant splinter groups retained to some degree, at least for a time, the protective tendencies of the medieval church and its suspicion toward the Jews. Martin Luther’s The Jews and Their Lies attacked the Jews on political as well as religious grounds. His influence is apparent in the fact that both Catholic and Protestant princes banished their resident Jews at various times in history. Unlike the Catholic Church, which remained unchanged in its teaching until the middle of the twentieth century, the Protestant sects were relatively more vulnerable to theological tampering. Beginning in the seventeenth century and gaining popularity in the nineteenth and twentieth centuries, Protestant theologians turned from a traditional devotional method of studying scripture to one based on a historical-critical approach. The primary goal of historical criticism is to ascertain the text’s original meaning in its original historical context and to demythologize it. The perspective of the early historical critics was rooted in Protestant Reformation ideology, in as much as their approaches to Biblical Studies were free from the influence of ecclesial tradition. A crisis in Protestant theology occurred in the mid-nineteenth century when German Protestant theologians shifted their focus from a supernatural Christ to a historical Jesus. Following a strictly historical approach, they jettisoned the ostensibly superfluous folk traditions on which Germanic Christianity was founded, in the expectation of discovering a more historical and authentic Jesus. As historians, they rejected the binding nature of church doctrine and viewed texts subjectively as products of the cultural and religious belief of their era. Utilizing the historical method of biblical exegesis which the Protestants had trusted to bolster the reasonableness of Christianity, Jewish scholars picked up these threads and arrived at a thoroughly unexpected but apparently irrefutable conclusion. Christianity, they said, was simply a derivative of the original and true religion, Judaism. Also in the nineteenth century a number of rabbis began to write the first histories of Judaism from the Jewish point of view. In these writings they portrayed Jesus positively as a conventional rabbi of his time, and claimed that Christianity was entirely the invention of Paul, who may very well have been a Greek. At the forefront of the new Jewish movement was the German rabbi Abraham Geiger, the founder of Jewish Studies and a leading proponent of Reform Judaism. With his book, Das Judentum und seine Geschichte (Judaism and Its History), published in 1865, he attempted to sever the link between Jesus and Christianity. Geiger claimed that Jesus had been the object of a conflict between first-century Pharisaic and Sadducean Judaism—of the liberal and conservative Jewish religious tendencies of the time. The definition of Jesus as a Jew is derived from Geiger, who was the first to declare that the faith of Jesus was Pharisaic Judaism, and that Christianity was merely dogmatic religion about Jesus and a subversion of Jesus’s own teachings. Geiger’s historical investigation of Christian origins thus undermined the basis of liberal Protestantism. When Jewish scholars also entered the field of New Testament historical studies, Protestant theologians found themselves in a quandary. Liberal Protestantism’s rejection of Christianity’s spiritual, mythological, and folk traditions left Protestant theology with little more than the historical figure of Jesus. Arguments presented by these scholars represented a serious and potentially devastating critique of Christian claims since they constituted an effort to Judaize Christianity and undermine the identification of Western civilization with Christianity. It was not until decades later that Protestant theologians during the National Socialist period were able to make use of contemporary scholarship and return to an appreciation of Teutonic foundations to rediscover an authentic Germanic church. To counter the arguments of the Reform rabbis, Protestants set certain aspects of Jesus’s life off limits to historical investigation. Regardless of his immersion in Jewish culture, they asserted, Jesus’s religious consciousness was unique, immune to the surrounding culture and therefore not subject to historical causation. Equally important was the matter of his race. The significance of Jesus as a historical figure shifted from his teachings to his spirituality and racial identity. Early evidence of the conceptualization of a non-Jewish Jesus can be found in the writings of the pietistic Protestant theologian Friedrich Schleiermacher (1768–1834), including a description of Jesus’s supernatural religious sensibility. In his writings, Schleiermacher presents Jesus as the founder of a new religion who had a unique awareness of the presence of God resulting from his unique religious consciousness. This provided a tool for liberal Protestants to avoid the theological perils of criticism in their historical investigation of the New Testament. Schleiermacher’s insights provided Protestant theology the ability to withstand the rigors of historical investigation by introducing the category of the inner religious consciousness of Jesus and placing it above and beyond the reach of historicity and historical research. Jesus’s Jewishness was said to be more apparent than real, simply the religion of his surroundings, but his racial identity was less contingent and most probably Aryan. In 1863 Geiger had defined Jesus as a Pharisee; in 1899 Houston Stewart Chamberlain described Jesus as an Aryan in his book, Die Grundlagen des Neunzehntun Jahrhunderts (The Foundations of the Nineteenth Century). The popularity of Chamberlain’s work gave the notion of the Aryan Jesus widespread credibility in Germany, and it began to be debated by theologians. In addition, the widespread völkisch religious movements that arose between 1870 and 1945 in Germany were rooted in teachings of race and nationalism. Many of these movements came into being outside of the institutional churches, but völkisch (i.e., folkish) ideology could be found within the Protestant church as well. An ethnically non-Jewish Jesus began to appear in various works of art. The composer, Richard Wagner brought to life the ethno-nationalist mythology of the German people, with his opera Parsifal depicting an Aryan redeemer. Parsifal, first performed in 1882, was recognized immediately in critical reviews as depicting a Germanic savior in opposition to a Semitic one. During its years of publication from 1878 to 1939, the Bayreuther Blätter (Bayreuth Notes), a magazine closely connected to Wagner and his circle, contained various articles asserting that the God of Christianity was not the god of Judaism, and also discussing the racial identity of Jesus. In 1905 the former pastor Gustav Frenssen wrote a widely popular theological novel, Hilligenlei, an allegory of Jesus as a savior from Schleswig-Holstein, in northern Germany. It implied that once Germany was able to recognize Jesus as Germanic, it would be able to undergo a spiritual rebirth. The novel sold 250,000 copies in Germany between 1905 and 1944, and was translated into forty languages, provoking numerous discussions in theological periodicals. 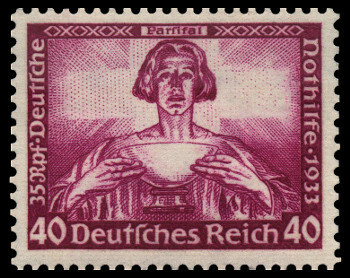 The National Socialists recognized the importance of religion in forming group identity. Christianity had come under attack by right wing nationalists, among others, who argued it was permeated with Judaism and therefore a foreign religion inappropriate to Germany. Instead they proposed it should be rejected entirely in favor of a revival of pagan religions. However, the anti-Christian neo-pagan movements were dismissed as not appealing to sufficient numbers of people. There were 40,000 members of the neo-pagan Glaubensbewegung (faith movement), compared to 20 million Roman Catholics, and 40 million Protestants registered in Germany during the 1930s. As a result, like the anti-Jewish parties of the nineteenth century, the National Socialists did not reject Christianity because they realized that doing so would offend the moral and cultural sensibilities of Germans. In addition, eliminating the Jewish elements from Christianity constituted Christianity’s assertion of itself as a Germanic religion. In the late twenties a group of nationalist Protestants arose calling themselves the Deutsch Christen and promoting a theology that identified Jesus as a great Germanic warrior. The German Christian movement was a faction within the Protestant Church of Germany, not a separate sect, and eventually attracted between a quarter and a third of Protestant church members. The reconciliation of Christianity with National Socialism, which they promoted, required the eradication of everything Jewish from Christianity. On May 6, 1939, a group of Deutsch Christen theologians and pastors led by Walter Grundmann, gathered at Wartburg Castle—an important place in Lutheran history—to celebrate the official opening of the Eisenach Institute for the Study and Eradication of Jewish Influence on German Church Life. On May 4, 1521, over 400 years earlier, Martin Luther had fled his enemies and arrived shortly afterwards at Wartburg Castle, where he spent the next ten months translating the New Testament into German. Within a year of its opening on May 6, 1939, the Institute’s own revised New Testament was published, purged of Jewish references and ready for use in the German Reich. The organization was well funded, claimed a membership of 600,000, and had branches in Scandinavia and Romania. The extent of the Institute’s appeal was remarkable: the academics and students of Protestant theology who became Institute members represented a cross-section of disciplines, geographic locations within the Reich, ages, and levels of scholarly accomplishment. In addition, some members were among the noted völkish writers of the era, unaffiliated with the church. In the six years of its existence, the Institute attempted to return Christianity to its original European configuration as a Germanic religion, whose founder Jesus was no Jew but rather had fought valiantly to destroy Judaism. The Institute launched a crusade to create a church that would eradicate Judaism from German church life. To radically revise the church and its teachings, members modified the New Testament (the Old Testament was not used), the hymnals, and the Catechism by incorporating Teutonic sagas and myths that were viewed as congruent with the teachings of Jesus. The Catholic Church was a problem for the German Protestants, because they accused it of retaining Jewish elements and because they were suspicious of its internationalism. Their ideology insisted that only Protestantism could be the national religion of Germans, and yet they also sought to win Catholic members for the German Christian movement. Within the Institute, Catholicism was praised for initiating anti-Jewish measures over the centuries, though never entirely trusted because of its uncompromising orthodoxy. Some Catholic theologians formulated arguments close to those of the Protestants of the Institute. At any rate, Catholicism had not yet undergone the disastrous modifications of Vatican II, which prescribed an almost complete reversal of its historical position on the Jews. The Reich’s regulations limiting Jewish involvement in public life did not include the churches; instead the churches issued their own regulations. The Protestant Christian Church was willing to alter fundamental Christian doctrine in order to bring the church into compliance with the Reich and welcomed the April 1933 order to remove Jews from the civil service by demanding that the church do likewise, and remove any non-Aryan Christians—i.e., baptized Jews—from positions within the church. In a departure from Christian practice, the church no longer permitted the conversion or baptism of Jews. This contravened the doctrine of baptism, according to which this sacrament transformed a Jew into a Christian. The German Christian leaders insisted that the National Socialist racial law took precedence and that baptism could not erase race. Since the Reformation the Protestant Church had been strongest in North and East Germany, and in the Scandinavian countries; many of the Institute leaders originated there. One of the largest conferences sponsored by the Institute was the Nordic Working Conference held in October 1942. Many of the participants were Scandinavians, including Swedes, Finns, and Norwegians. Participants discussed the Thule (a place in Nordic mythology) and the medieval Teutonic Heliand text. The Heliand is an epic Saxon poem written in the ninth century to aid in the conversion of the Saxons. Christ is represented as a sovereign ruler, who gathers about him his loyal vassals, the Apostles. With their aid he founds his kingdom upon earth, and appears throughout his career as the beneficent lord of men. The atmosphere of the Heliand is purely German. Thomas and Peter are bold German warriors who cannot restrain their valor and their loyalty when their liege-lord is assailed by the traitorous Jews. In addition an attempt was made to introduce Teutonic myths and rituals as proto-Christian. These were part of broader efforts by German scholars in the field of Nordic studies to understand the underlying religiosity of myths, and their underlying messages about race and Heimat. The assertions put forward by the Institute, particularly the argument that Jesus was not a Jew, but rather had sought the destruction of Judaism, were based on research gathered since the turn of the century. A number of scholarly disciplines were employed to prove the Aryan nature of Jesus, including psychology, linguistics, mythology, and racial history. These included: 1) findings about languages and religions as manifestations of race; 2) historicist distinctions between Jesus’s teachings and those of first-century Judaism, presented by New Testament scholars; 3) claims that Jesus’s religious teachings originated in Hellenism, Buddhism, Hinduism or Zoroastrianism; and 4) assertions about the non-Jewish population of the Galilee in the centuries leading up to Jesus’s day. The original Aryans, it was believed, had possessed a unique kind of monotheism, mostly lost over time, but preserved in Zoroastrianism and revived in Christianity. Jesus became the Germanic identity of Christianity. In the context of Third Reich politics, Jesus was the heroic figure through whom the fundamental race distinction between Jew and Aryan could be affirmed. A situation similar to that which existed in the early Middle Ages was restored by a close alliance between the religious and the political powers, though now the religious component was subsidiary to the political. The defeat of National Socialism signified the demise of Germanic Christianity, both Protestant and Catholic. Like all aspects of German society, Protestant theology was obliged to undergo de-Nazification. When the Protestant Church was deprived of its Germanic elements, guilt-laden Protestants became susceptible to any theological novelty, even novelties that imperiled their ethnic interests: existentialism, liberation theology, and universalism. [It] religiously . . . committed suicide . . . the Catholic Church [had] exhibited a monolithic solidarity that made it seem impregnable. . . . Then, it was suddenly shattered by an internal revolution, as sudden and drastic as the Jews’ Bolshevik revolution in Russia, and far more surprising to observers of world affairs. . . . If one considered the new doctrine critically, one immediately saw what had been the cardinal and most drastic change. The attitude toward the Jews that the Christian god had presumably ordained for nineteen centuries was reversed. The document referred to, Nostra Aetate (Latin: In Our Age), is a central one of the Second Vatican Council. With it the Council repudiated any interpretation of the New Testament which had ordered that Jews were collectively cursed for all time because of the Crucifixion. The Vatican document reads, “What happened in His Passion cannot be charged against the Jews without distinction then alive or against the Jews of today” (Nostra Aetate, 4). Until that declaration, the Matthias phrase from the Gospel of St. Matthew, which placed the blame for the Passion on the Jews, had been Catholic teaching for fifteen hundred years. Some of his friendships with Catholics came about because of his involvement with Nostra Aetate, the Second Vatican Council’s “Declaration on the Relationship of the Church to Non-Christian Religions.” Some bishops insisted that the ultimate conversion of Jews be included in the final version of the document. My father’s objection was unequivocal: the phrase had to be eliminated. If faced with the alternative of conversion or death, he said, he would rather go to Auschwitz. I was terrified when I heard him say this. My father met with Pope Paul VI to make his objection clear, and he said many times that he was told after their meeting that the pope took his pen and crossed out the sentence. Just as the Jewish theologian Abraham Heschel used any means to defend his race and culture, so should we. Since Christians consider the events of Holy Week to be the central events in history, the Passion story has been the subject of innumerable works of Western art and music. Passion art has been a primary means of conveying the most profound expression of Western individuality—the hope for personal salvation. At the same time, it has also been a vehicle for re-enforcing our people’s understanding of the dangers of Jewish influence. For those who consider art peripheral to White interests, it should be remembered that Gibson’s The Passion of the Christ grossed $600,000,000 and the 2000 production of the Oberammergau Passion Play grossed $30,000,000. According to the Pew Forum of 2007, 78 percent of White Americans still consider themselves affiliated with Christianity. The great Passion works are among the most sublime of European artistic expression and have played a role in reinforcing our culture’s religious and racial beliefs. Because of this, the subtle and complex emotive responses that Passion art evokes will continue to influence many more Whites than will White identity journals or conferences devoted to White interests. Sadly, these great works are now routinely attacked by Jewish organizations like the Anti-Defamation League and the American Jewish Committee, which criticize Passion works for harboring anti-Semitism and demand that performances be altered or closed down. In the early centuries of the European Christian era Christ had been depicted as a simple shepherd, and symbolically as the Chi Rho, Constantine’s symbol of triumph and victory. It was not until the Middle Ages, when Jews became ever more numerous in Europe, that the image of a suffering Christ began to appear and that Jews began to be negatively depicted in Passion iconography. At the time that Christ is first depicted as an Aryan, his killers are represented as stereotypical Jews. (See, e.g., Hieronymus Bosch’s Christ Carrying the Cross [c. 1490; Museum of Fine Arts, Ghent].) Alternatively, Jesus was represented as the blond victor over death. 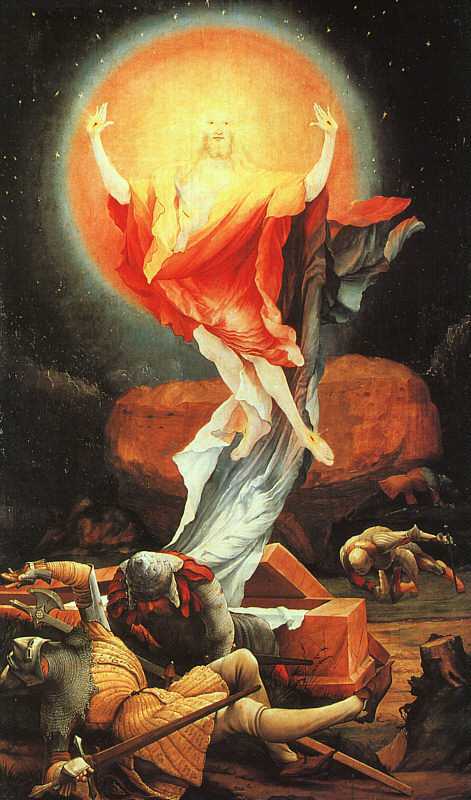 (See, e.g., Matthias Grünewald, Resurrection Scene from his Isenheim Altarpiece, c. 1550.) Taking their cue from the Middle Ages, the National Socialist theologians again depicted Christ as a victorious Germanic warrior. From very early in Western musical history it became the custom to chant the Passion accounts during the liturgy of Holy Week. The St. John Passion for the Good Friday service and the St. Matthew Passion on Palm Sunday were dramatic ways to tell the story of Jesus’s death and his resurrection to mostly illiterate audiences. The roots of these practices go back to Latin models from the twelfth century. Between the fourteenth and sixteenth century, over three hundred villages in Germany and Austria had their own versions of the passion plays. The townspeople of Oberammergau founded their passion play in 1633 out of gratitude for having escaped from the bubonic plague. The plays generally remained unchanged until the end of World War II. The most significant change in the 2010 Passion Play was the firm depiction of Jesus as Jewish, lifting a Torah prop high and leading the people in singing the Jewish Sh’ma prayer. The American Jewish Committee intends to continue to monitor any lingering anti-Jewish elements of the Oberammergau Passion Play. Choirs are often hesitant to perform the great work because of fear of the responses of critics and audiences. These have included heated student objections to recent performances of the St. John Passion at Swarthmore College, and the picketing of the concert at the Oregon Bach Festival. At the Oregon Bach Festival a local paper referred to Bach’s Passion as “a musical work whose text has been an incitement to genocide.” This was followed by the usual endless discussions about anti-Semitism and the danger of another Holocaust. 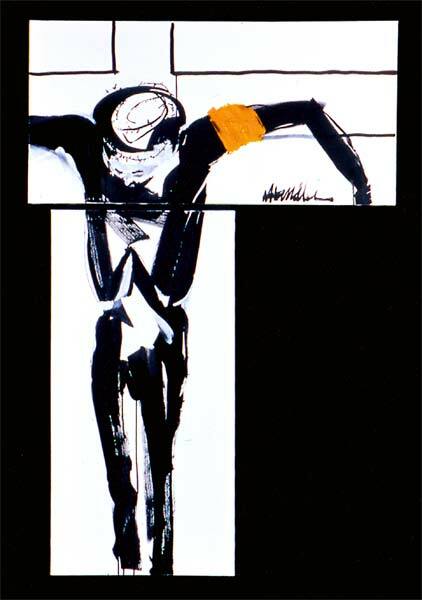 For an English translation of the Oratorio for Good Friday, see here. Passion music continues to be composed by Christians and continues to be censored by Jewish critics. The contemporary Scottish Catholic composer, James MacMillan, is one of Europe’s most prolific composers. His work comprises secular as well as significant liturgical works. In recent years MacMillan has shifted his focus from the Catholic Liberation theology he was drawn to in his youth to more traditional Catholicism. A recent work, The St. John Passion (2007), was lauded by The Catholic Herald for its “refreshing Catholic truculence.” However, while MacMillan’s early works which were inspired by Liberation theology received consistent praise from Jewish musicologists, his St. John Passion has been widely criticized by Jewish reviewers. The Gospel of St. John itself is a troubling text, unique among the Gospels in blaming the Jews for the death of Jesus. . . . Bach’s St. John Passion, which, in sound, contains a devastating portrait of crowds of murderous Jews, is widely perceived as escaping charges of anti-Semitism from listeners today, since a composer of supreme authority and accomplishment wrote it in the context of 18th-century Lutheranism. What’s okay for Bach, however, is not okay for MacMillan. Far from putting the anti-Semitic potential of the Gospel of St. John into mitigating historical context, MacMillan underlines it by adding the “Good Friday Reproaches.” . . . The reproaches are not, by any means, essential for a viable “St. John Passion” in our time. The Good Friday Reproaches, sung since the ninth century, were seldom performed after 1970. When Jews reported their concerns about the Reproaches to the US Bishop Secretariat for Catholics and Jews, parishes were told to substitute less controversial Good Friday music. MacMillan’s revival of the Good Friday Reproaches is a return to Christian liturgical origins. To hear a sample of MacMillan’s Passion, listen here. November 2011 marked the publication of the first Jewish Annotated New Testament. Edited by two Orthodox Jews, Amy-Jill Levine and Marc Zvi Brettler, the edition includes notes and explanatory essays by 50 leading Jewish scholars. Levine is also the author of a book in which she celebrates the Jewishness of Jesus, The Misunderstood Jew: The Church and the Scandal of the Jewish Jesus (2006), and in addition has edited The Historic Jesus in Context. Jewish scholars have, of course, long dominated the Old Testament chairs of university religion departments and Christian seminaries. That they are now assuming New Testament faculty positions will significantly influence the New Testament interpretation for future clergy and affect the ability to retain the Christian religious foundation of Western culture. Ultimately, growing Jewish influence in the field of New Testament Studies will further Judaize Christianity and Western culture by subsuming Christianity within Judaism and obfuscating the boundaries between Jews and non-Jews. When such differences are minimized, the collectivist tendencies of White Westerners would further weaken, as would perceptions of hostile Jewish influence. Reaching a much larger audience than The Jewish Annotated New Testament, but equally problematic, is Hasidic Rabbi Shmuley Boteach’s Kosher Jesus. Boteach, the London Times’ “Preacher of the Year at the Millennium” and winner of the American Jewish Press Association’s “Highest Award for Excellence in Commentary.” The best-selling author of 25 books, and named by Newsweek as one of the 50 most influential rabbis in the United States three years in a row, Boteach is a media personality, failed Republican Congressional candidate, and frequent guest on Oprah. Boteach has found Jesus. We in the Jewish community have a choice. . . . We can either, as has happened for 2,000 years, allow the Christian community to teach us about the Christian Christ, or we can take the initiative and the responsibility of teaching the Christian community about the Jewish Jesus. . . . He was a Jew, after all. Conflict between Christianity and Judaism dates from the ancient world. There is no question that the early Church, particularly during the formative period of the fourth century, had an anti-Jewish animus apparent in the liturgy—an animus likely the result of group conflict between Jews and Christians during that period (see Chap. 3 of Separation and Its Discontents). This tradition was maintained throughout the centuries not only in the liturgy, but also in prominent forms of Christian art, such as the Passion Plays and Easter music. [The Kingdom of God] is the Christian Church, which was able silently to leaven the Roman Empire, which has outlived the ruin of the Jewish Temple and its worship, and which, in the course of centuries, has extended to the confines of the world the knowledge and the worship of the God of Abraham, while Judaism has remained the barren fig-tree which Jesus condemned during His mortal life. . . .
[After the resurrection of Jesus,] the Church . . . took the independent attitude which it has maintained ever since. Conscious of their Divine mission, its leaders boldly charged the Jewish rulers with the death of Jesus, and freely “taught and preached Christ Jesus,” disregarding the threats and injunctions of men whom they considered as in mad revolt against God and His Christ (Acts 4). The article portrays Church laws against Jews, such as laws against Jews having Christian slaves and forcing Jews to live in ghettos, as necessary to protect the Christian faith. And it accurately portrays the Church in later centuries as at times protecting Jews against popular anti-Jewish actions. However, it asserts that the causes of popular anti-Semitism included real conflicts between Jews and non-Jews and are not only due to Christian religious ideology. Although far from perfect, the Catholic Church and Christianity in general have played the role of ethnic and cultural defense in the past. It is certainly not surprising that Jewish activists have attempted to suppress by any suggestion that Christianity might be returning to its historic self-conception. It is an excellent marker of Jewish power in the contemporary West that this Jewish effort has had substantial success. Susannah Heschel, The Aryan Jesus: Christian Theologians and the Bible in Nazi Germany (Princeton, NJ: Princeton University Press, 2008), 155. Shmuley Boteach, Kosher Jesus (Cedarhurst, NY: Gefen Publishing House, 2012); from the dust jacket. Kevin MacDonald, Separation and Its Discontents: Toward an Evolutionary Theory of Anti-Semitism (Westport, CT: Praeger, 1998; paperback edition: Bloomington, IN: AuthorHouse, 2004), Chapters 4 and 5. James C. Russell, The Germanization of Early Medieval Christianity: A Sociohistorical Approach to Religious Transformation (New York: Oxford University Press, 1994). Susannah Heschel, Abraham Geiger and the Jewish Jesus (Chicago: University of Chicago Press, 1998), 7. Charles G. Herbermann, “The Heliand,” The Catholic Encyclopedia (1910). The German word Heimat connotes love and attachment to homeland. Heschel, The Aryan Jesus, 39–41. Russell, The Germanization of Early Medieval Christianity, viii. Revilo P. Oliver, “How They Stole the Church,” Liberty Bell, August 1991. Doris Donnelly, “Lovingly Observant: An Interview with Susannah Heschel,” America: The National Catholic Weekly, June 18, 2007. James Shapiro, Oberammergau: The Troubling Story of the World’s Most Famous Passion Play (New York: Vintage, 2001); Publisher’s Weekly description on Amazon. Pamela Berger, “The Depiction of Jews in Early Passion Iconography,” in Pondering the Passion, ed. Phillip A. Cunningham (New York: Rowman and Littlefield, 2004), 67–86. Johannes Hartau documents the Jewish iconography in Bosch’s work. 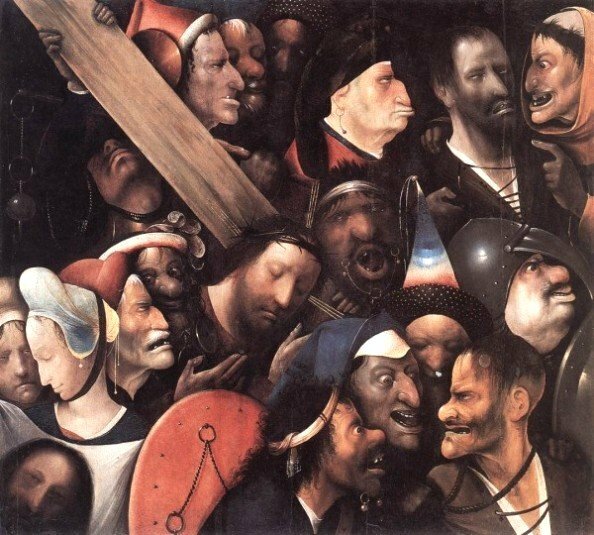 “Hieronymous Bosch and the Jews,” Anales del Insituto de Investigaciones Estéticas, no. 86 (2005): 29–53. A. James Rudin, “Oberammergau: A Case Study of Passion Plays,” in Pondering the Passion, ed. Phillip A. Cunningham (New York: Rowman and Littlefield, 2004), 97–108. American Jewish Committee, “Oberammergau Passion Play, Better, But Not Good” (2012). American Jewish Committee, “Oberammergau Passion Play—Introduction” (2012). Michael Marissen, “Bach’s St. John Passion and the Jews,” Institute of Sacred Music, Yale. Michael Marissen, Lutheranism, Anti-Judaism, and Bach’s St. John Passion (New York: Oxford University Press, 1998). Joe Patti, “Rousing Passion,” Butts in the Seats Blog (April 19, 2005). Benjamin Ivry, “MacMillan and Strife: A New St. John Passion,” Forward, March 6, 2009, print edition. Mark Oppenheimer, “Focusing on the Jewish Story of the New Testament,” New York Times, November 25, 2011. Mitchell Landsberg, “Rabbi’s ‘Kosher Jesus’ Book is Denounced as Heresy,” Los Angeles Times, February 5, 2012. MacDonald, Separation and Its Discontents, Chapter 3. “Judaism,” The Catholic Encyclopedia (1910).